The B17 was one of the most successful heavy bombers of WW2. It was developed by Boeing in the 1930s for the United States Army Air Corps (USAAC). 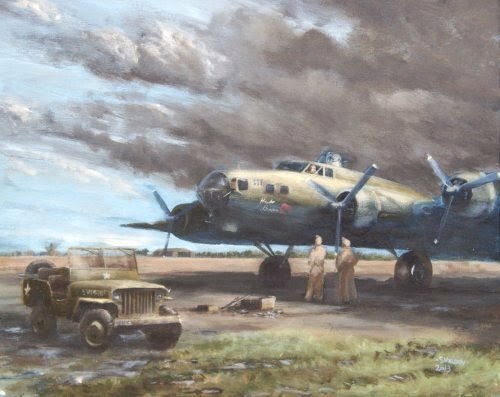 A great many B17s were stationed in England during the war, particularly in the eastern half of the country where the landscape was flat and airfields were easy to build. From here they had the shortest possible run to the enemy occupied countries of Europe, at least until the D Day landings of 1944. The "gremlin" was a mythical creature invented by the fitters who worked on aircraft during WW2 (some disagree, saying that they were a part of english mythology before then). Either way, the ground crew and the air crew in the allied air forces took the gremlins to their hearts and enjoyed blaming them for everything that went wrong with their machines. "Gremlin Corner" was a spot on every airfield where the problem aircraft went to be mended, and their gremlins got rid of, before rejoining the squadron.